On the national stage, Charest's drive for re-election led to a massive influx of cash from Ottawa to ensure the election of the most federalist Premier in Stephen Harper's lifetime. When Charest turned the cash around into a 700 million dollar tax break in less time than a Gilles Duceppe leadership run, he pretty much exposed the fiscal imbalance hype as being nothing more than a mythical creature. It also set off a new round of bickering between the provinces and Ottawa that featured attack ads and lawsuits. And, if the polls are to be believed, the tax cuts were about as popular in Quebec as they were outside the province, nearly threatening to bring down his government a few weeks after the election. As for the election itself, it was far and away the most interesting of the six, with three parties legitimately in the game. The ADQ was on the rise led by Mario Dumont and the PQ was floundering with Andre Boisclair, the biggest bust to come out of Quebec since Alexander Daigle. 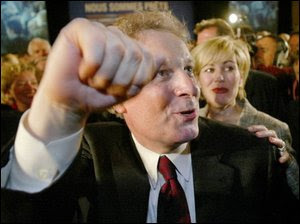 And while it's hard to claim victory when a majority turns to the slimmest of minorities, Charest did manage to hang on. If you're someone who watches politics like sports (and you probably are if you're reading this blog), it doesn't get much better than the 2007 Quebec election. And that's why Jean Charest was the Man of the Year in the eyes of this blogger. posted by calgarygrit at 2:20 p.m.
WOW, and it only cost $700M? Couldn't ask for more lame opponents. One's already gone and the other is cozying up with Steve. By art, at 1:15 p.m.
HMs? Dalton McGuinty, Brad Wall, Karlheinz Schreiber? By sir john a., at 9:33 p.m.
By Anonymous, at 3:10 a.m.
Bill Casey was pretty good as well, showing what regional representation really means. By 900 ft Jesus, at 9:04 a.m. He just ran rings around his politcal opponents on one issue after another. Despite being in a minority position with 3 parties that detest him! By Canuck1955, at 7:02 p.m.
By Data recovery software, at 2:31 a.m.
By Ali Gibson, at 5:54 a.m.
By Games Gamers, at 5:38 p.m.